were developed by the Investment & Trust Services Department of Citizens State Bank & Trust Co. of Ellsworth, Kansas as a way to offer a diversified, managed investment offering which is intended to act as the primary foundation for a long term portfolio. The CMF Portfolios are made up of some of the nation's top performing mutual funds as rated by Morningstar and Value Line Mutual Fund Survey. The underlying mutual funds of the CMF Portfolios are no-load funds grouped by objective and management style so as to provide a complimentary range of investment options from conservative to aggressive. These portfolios provide the foundation for account values over $10,000. A brief explanation of each of the model portfolios is listed below. is our tax free bond portfolio developed for higher income investors who desire a tax-free income stream. This portfolio generates monthly dividends that are free from federal income tax, and partially free from Kansas State Income Tax. This portfolio is also very conservative, investing in bonds with an average credit quality rating of A or higher as rated by Moody's bond rating service. Investors in this portfolio should have a 2 to 5 year investment time frame. was developed for investors seeking a monthly dividend for income purposes along with some stock exposure for growth purposes. Investors in this portfolio should expect the value of their investment to fluctuate and should plan on an investment time frame of at least 3 to 5 years. offers investors the potential for share price appreciation as well as monthly dividend income. This portfolio is best suited for investors with a moderate tolerance for risk. is an even mix of stocks and bonds. This portfolio is well suited for any investors with a moderate risk tolerance and a time horizon of 5 or more years. is designed for investors who are moderately aggressive and seek the growth potential of stocks but who also want the cushion of bonds and dividend income. Investors in this portfolio should have a moderate to high tolerance for risk and an investment time frame of 6 years or more. is for aggressive investors. Investors in this portfolio can expect significant volatility in principal value. This portfolio is designed for investors with a high tolerance for risk and a 7 to 10 year or longer investment time frame. Individual securities such as stocks, bonds, etc. Once an investor has established a foundation for their investment portfolio through our CMF Portfolios, we can begin to enhance portfolio yield and capital appreciation potential by adding individual investment securities. We recommend that investors have a foundation established through our CMF Portfolios of at least fifty-thousand dollars ($50,000) before we begin investing in individual securities. This is particularly true for equities or stock holdings, due to the fact that no single equity holding should exceed 5% of the total portfolio (a portfolio value under $50,000 only allows for the purchase of $2,500 in stock). All securities are screened as to their safety and client suitability. Individual stocks, bonds and exchange traded funds (ETF's) and closed end funds (CEF's) will be monitored so as to keep the overall asset allocation of our client's portfolios in line with their investment objective. 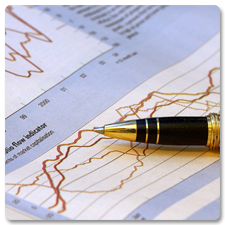 We strive to provide investments that our clients will be proud to own, regardless of the direction of the markets. For new investors or for people who wish to start a small investment account for a child or grandchild our mutual fund offerings by Federated Investors are a good option. These funds are a great way to get professional management along with broad diversification for smaller accounts. Investment options range from very conservative US Government Money funds to bond funds and aggressive stock funds. We typically provide this option for accounts under ten-thousand dollars ($10,000 or less). Non-publicly traded stock of small businesses can offer a unique and profitable investment opportunity, particularly for clients who wish to invest in these securities through their Individual Retirement Accounts (IRA). Most investment firms do not offer this option, however, through our Investment and Trust Services Department, we can usually design an account to allow our clients to invest in these holdings.